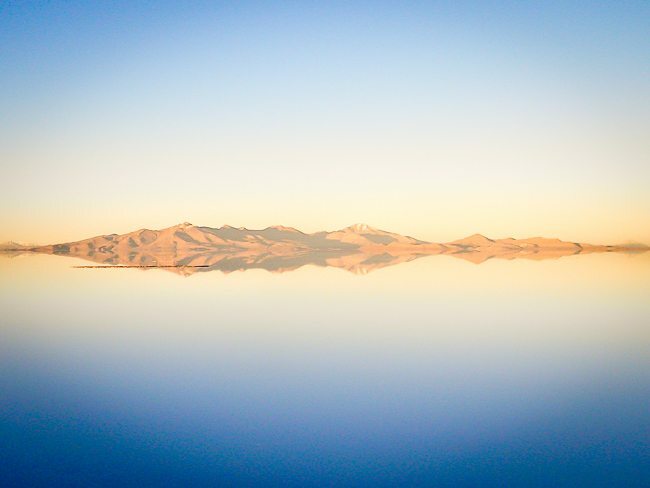 WHY YOU HAVE TO VISIT SALAR DE UYUNI, THE LARGEST SALT DESERT IN THE WORLD | Bringing you travel inspiration and information from around the world. 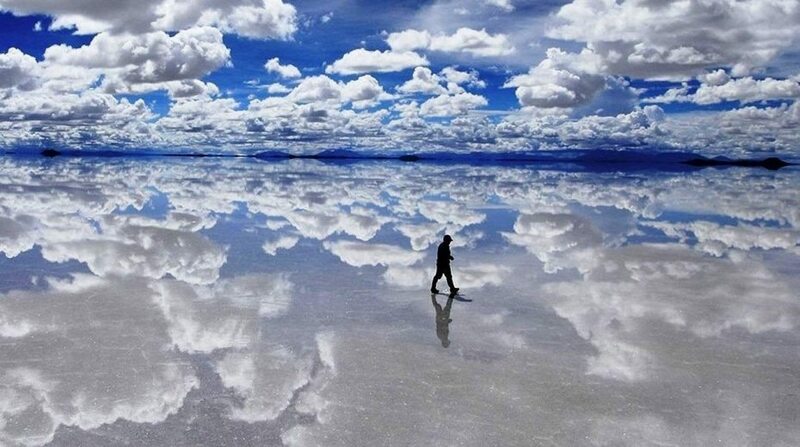 One of the “must go” attractions when visiting South America, is the Salar de Uyuni salt flats in Bolivia. Tucked in the southwest of the country, covering more than 10,000 square kilometres, you will find this iconic salt flat desert. Formed over millennia, as a result of many rivers going dry, this salt flat is now the largest salt desert in the world! Its pure white surface extending over endless miles, provide the perfect setting for some fun, guessing distances between objects. It really is quite hard to accurately say how far things are from each other! The salt desert being perfectly white, gives one the feeling of being lost in your own mysterious dreams of a world with no edges or boundaries. When looking straight ahead, you can never quite tell where the horizon is, as the desert reflects perfectly everything around it. Skies merge with land and mountains are no longer triangular, but a diamond instead. It surely is a place like no other. The result, when taking a picture, is quite fun! 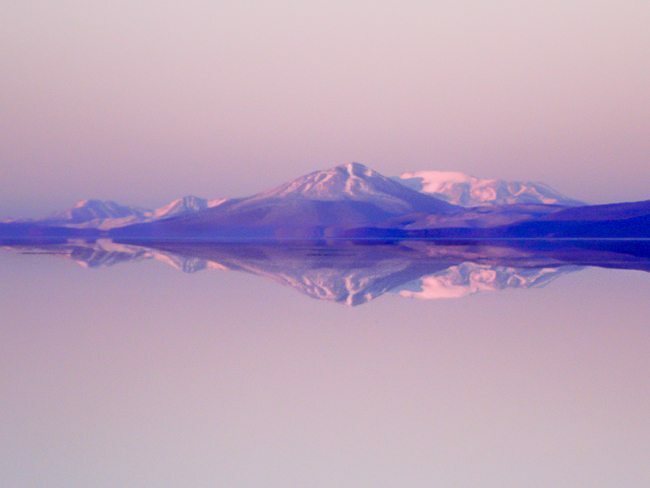 The reason you need to visit the Salar de Uyuni is to experience first-hand the mirroring effect. When it rains, water a few centimetres deep, covers the surface, enabling the reflection of everything above it. It really feels just like walking on a giant mirror! The result is astonishing! Your car, yourself, the mountain, the sun, everything gets reflected on the surface and it looks amazing. Obviously, therefore, to experience the mirror effect, you need to plan your visit when it rains. The rainy season in Bolivia is from November to January, and that’s when you have the best chance to experience this. 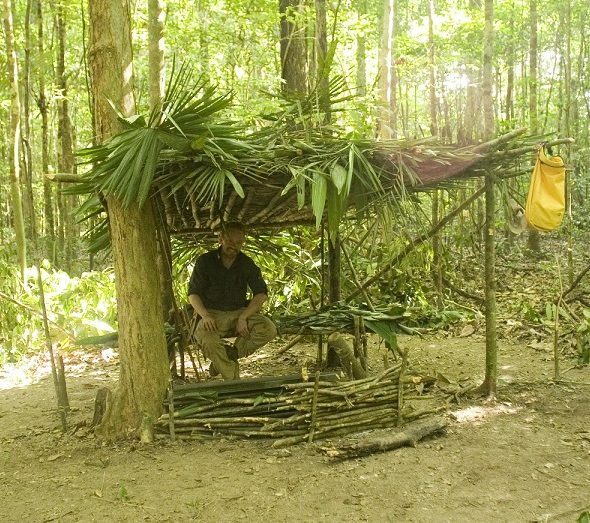 Bear in mind though, that visiting during the rainy season does not guarantee you the experience of this magical phenomena…. many witness the mirroring even outside the rainy season. It is all about the odds, as they say! We strongly advise you to wake up early and watch the sun rising in the desert. Due to the mirroring effect, the sun rise becomes doubly pretty. 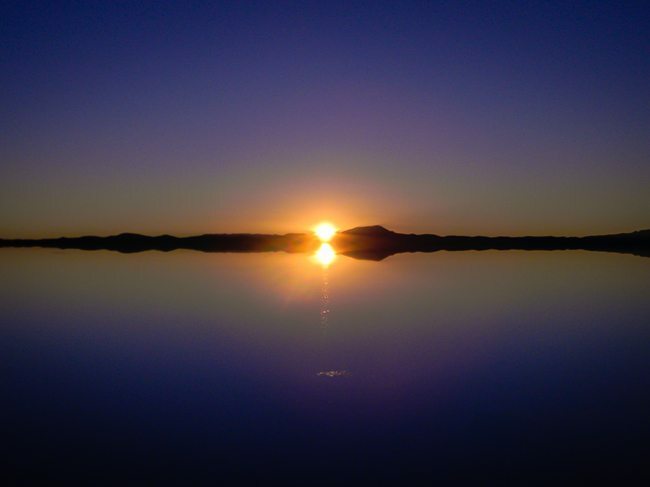 As the sun rises upwards in the sky, its reflection will appear to move further and further down! From where do I go and how to get around? Even though it is one of the main attractions in Bolivia, there is no need to book the trip in advance. 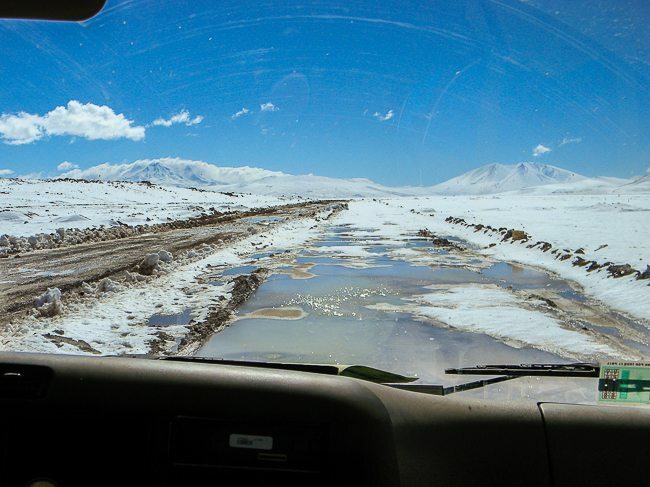 There are numerous 4×4 jeeps going in every day and you can book your tour based on your budget before you leave. You can book your tour from any major city, such as like La Paz, Oruro, Sucre or Potosi. 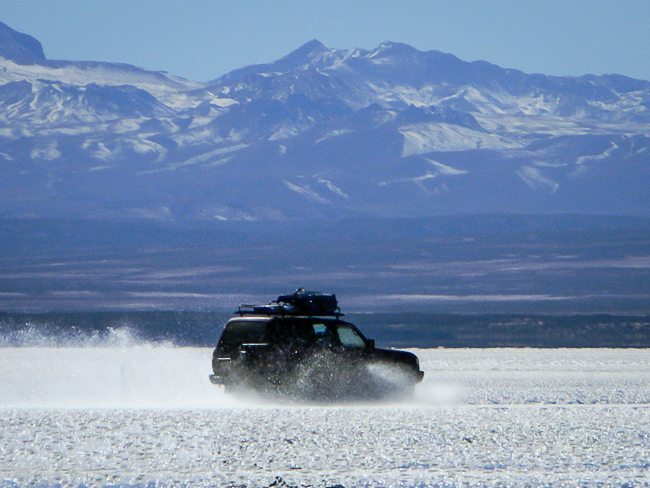 For the budget conscious, it is preferable to make your own way to Uyuni and then book from there. 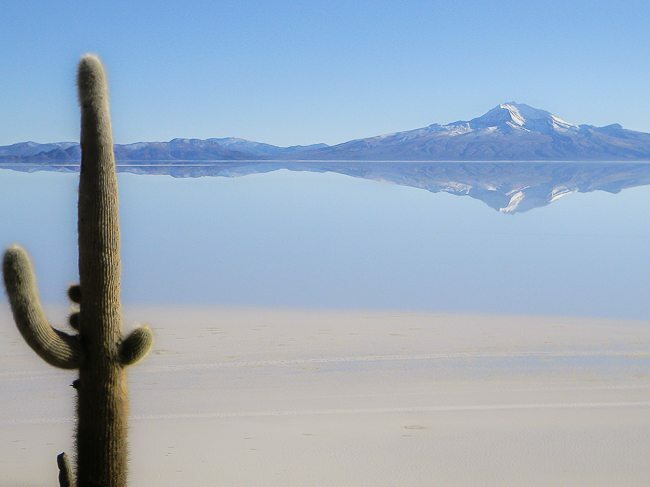 While booking a trip to Salar de Uyuni, you can also have a tour booked to the Atacama Desert, in Chile. 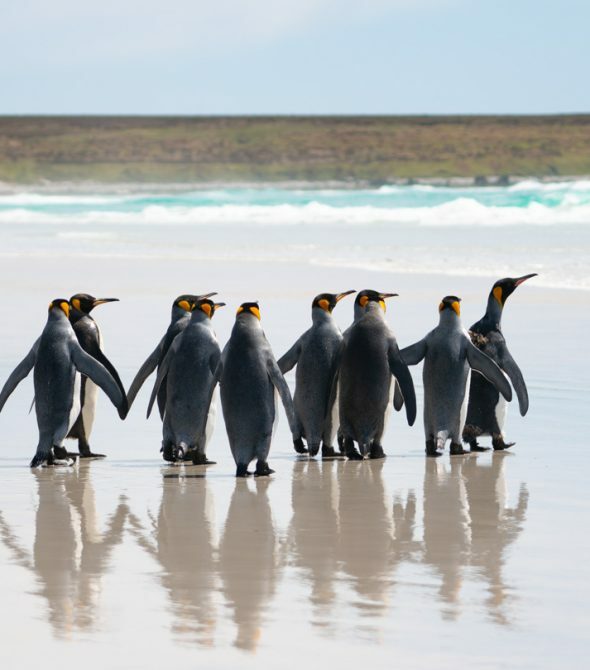 The tours arranged can be for daytrip or encompass a multi-day itinerary covering visits to volcanos, lakes, geysers and everything else the country has to offer. 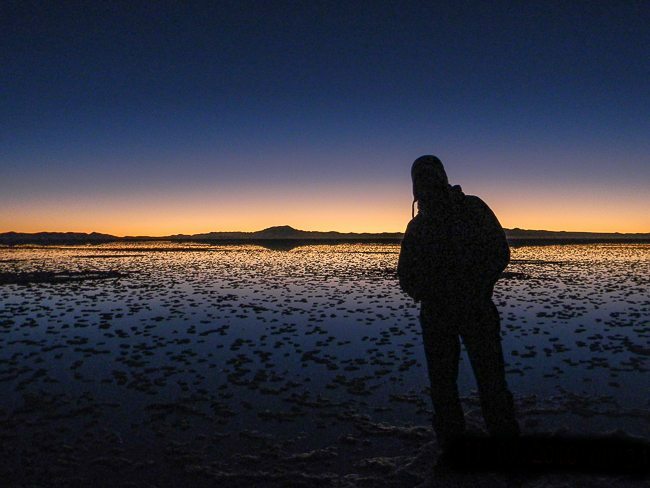 Just a quick word of caution, tour companies in Bolivia are not famous for being trustworthy. 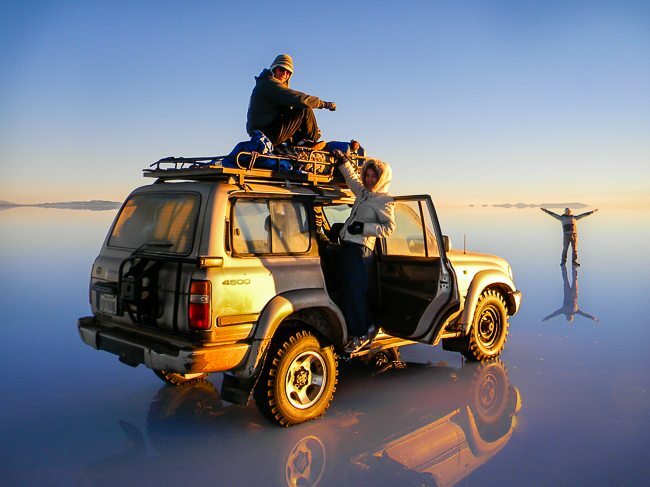 We would recommend that you better book your tour from a city other than Uyuni, if you don’t want to be put in a minibus which you could have caught yourself anyway and at half the price! 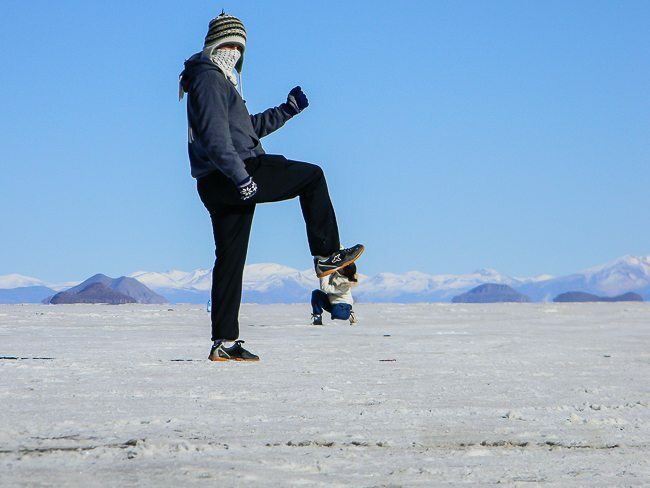 There are a few places to stay in Uyuni city, including a backpacker hostel. 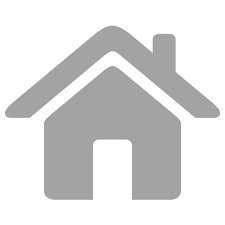 As building materials are scarce in the region, hotels and building are built out of with salt blocks. There used to be a hotel completely made of salt right in the middle of the desert, including the walls, the roof, the furniture, even the bed you sleep in. However, as the sewage disposal were not in line with environmental regulations, it had to be shut down. Today, it is a museum that you can visit. Nevertheless, the Palacio de Sal offers a great experience – and you pay the price ($150). 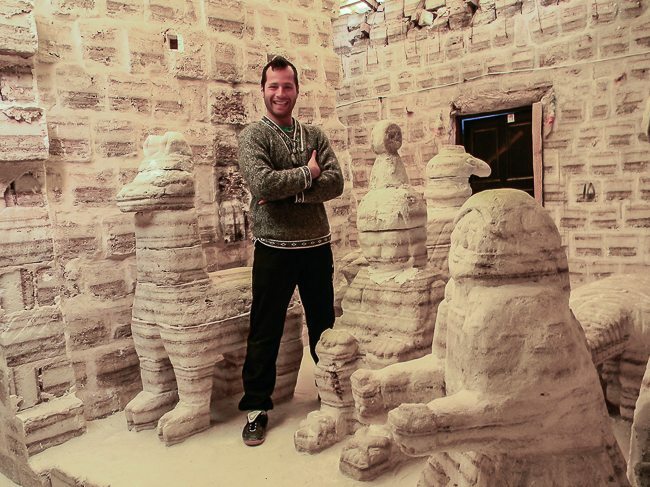 As most of its structure is made of salt stones, the hotel has a peculiar warning for its guests, no licking walls and furnitures! Should I have any worries? It is best to avoid travelling to the salt flats after the end of year’s festive holidays, as your driver would probably be drunk! Nobody wants that! It is really important to avoid drunk drivers as the conditions in the desert are harsh and getting lost in the middle of the desert could be really unpleasant and potentially fatal! Moreover, due to the area being very dry and the white surface reflecting the sunrays, if you do not have sunscreen on, you will definitely end up with a sunburnt face. And do carry warm clothes as the desert gets really cold once the sun goes down. 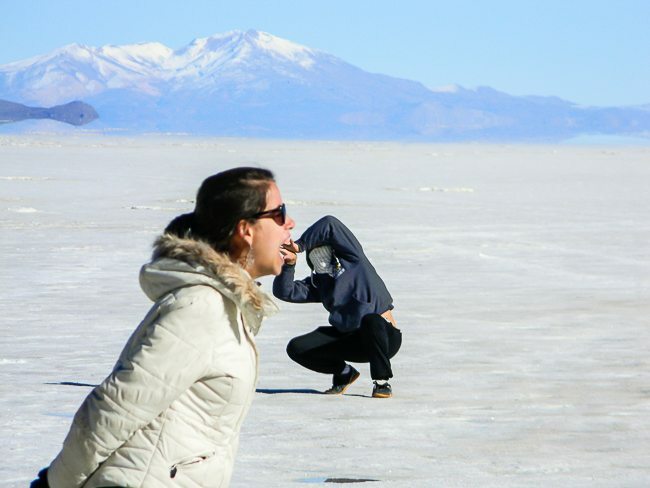 We booked our tour from the Atacama Desert but we actually HAD to do that. Lucky for us, when we were in Atacama, the worst storm in a century was raging and the borders were closed. 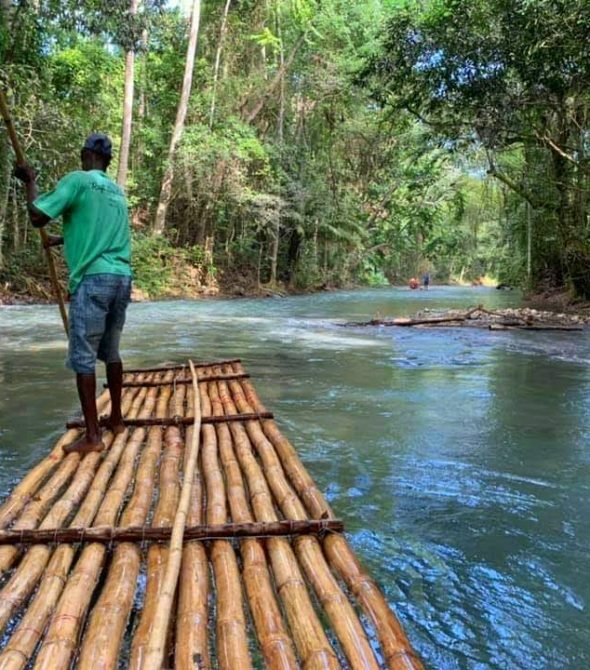 The only way to cross, was with a tour company. We had the options of staying put in Atacama and miss three or more days of our trip or book with a tour operator. 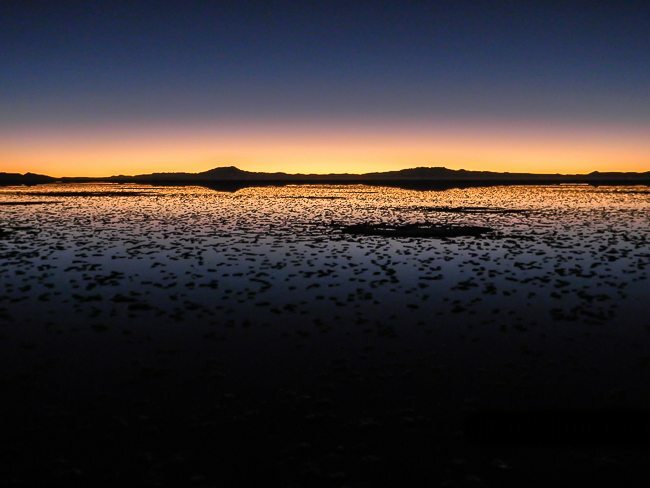 We can say from experience that is not really worth getting a tour booked to the Salar from outside Uyuni. Regarding souvenirs, remember everything is made of salt and once you are back home in different atmospheric conditions it would surely have melted away. So, we would recommend to leave the souvenirs aside and treasure the memories of an experience of a lifetime!